When cooking over wood, look for seasoned dried hardwoods, which burn hotter and last longer than softer woods such as pine. Look for woods like hickory, ash, beech or oak, or from fruit trees like cherry or almond. You can add more distinct flavors by using soaked wood chips or mesquite chunks. If you’ve ever gone camping, or you have a fireplace, this should come easy. Build a pile of kindling (wood chips, newspaper or some other sort of tinder), and then surround it with a teepee of small twigs. Add larger pieces of wood when the fire starts to burn. Wood Embers Cooking Meat on Asado GrillStart the fire early, and make sure you have plenty of wood. You’re not going to cook over an open flame here, which can leave you with steaks or chicken that taste like charcoal. Let the fire build and then burn down until the wood turns into embers. Those embers are hotter than the fire. Once you have a nice bed of embers going, put down your grill grate and begin working. But be careful: you can still get the same kind of flare ups you’d see with a gas or charcoal grill, so keep an eye on your food to avoid charring. And if you’re thinking about grilling some dessert, just add a few pieces of wood to the embers to restart your fire. True Argentinian cooking requires you to go slow, over a lower, indirect heat. And go easy on the seasoning. Add some salt and pepper before you cook, and maybe put some fresh herbs on the coal to add flavor. Once the meat has rested, add chimichurri sauce, a staple of the Latin barbecue. Put the steaks on the grill, let them brown on one side for three minutes, and then flip it, salting the brown side. Turn after three minutes and repeat. Rotate the steaks every few minutes for a total of about 12 minutes of cooking, then let them rest for 15 minutes before carving. If you carve too soon, the steaks will lose their juiciness. 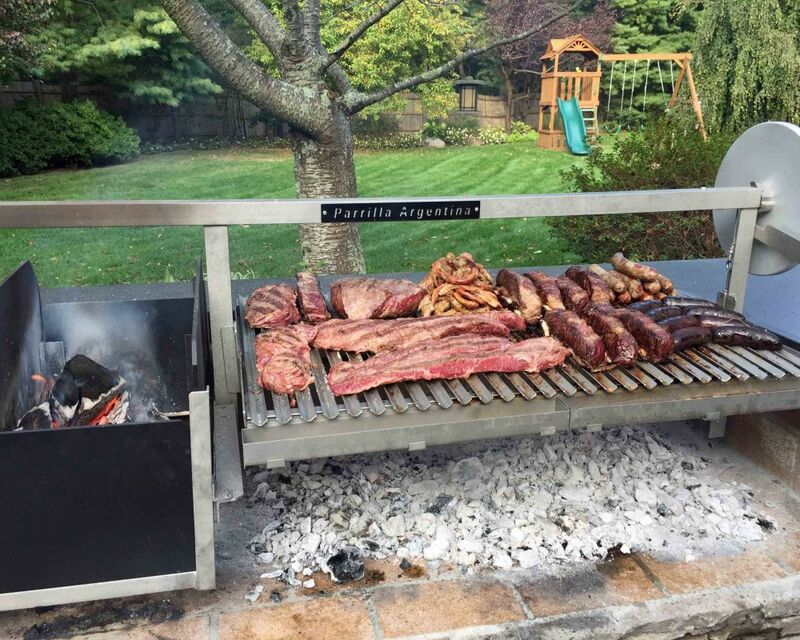 If this type of cookout appeals to you, Gaucho Grills can help. We’ve modeled our grills after the traditional Argentine parrilla, allowing barbecue enthusiasts to raise and lower the grilling surface over burning wood for a variety of different dishes. You may be miles away from Argentina, but with our help, you can take your cooking to new places.